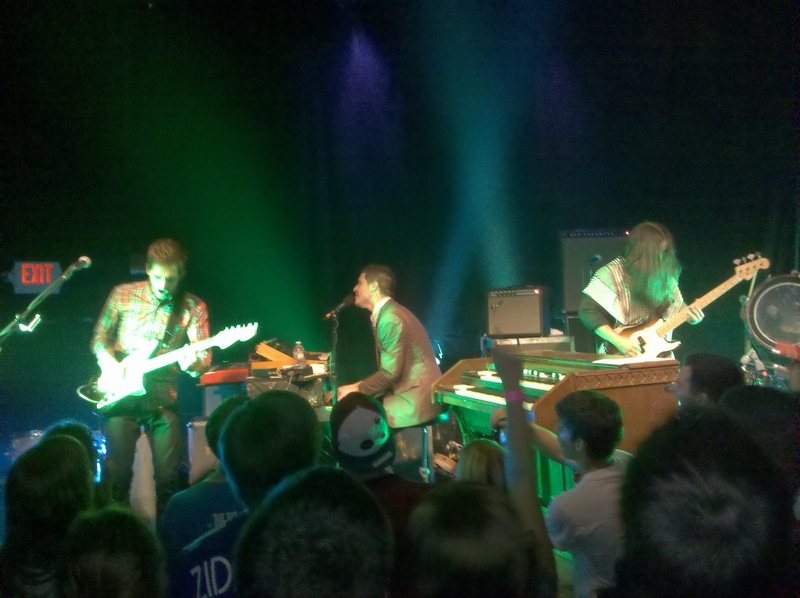 After 3 successful albums, several appearances on the late night shows of David Letterman, Jay Leno, Jimmy Kimmel, Craig Ferguson, and others, Mutemath, the 2007 Grammy Nominated alt rock band known for their creative and energetic performances finally descended on Burlington's only "little big venue", Higher Ground. Why then, was the show tucked away in the smaller Showcase lounge, with only around 70 or so people in attendance? Concert review, photos, and video after the jump. The scene in the showcase lounge was very unassuming. Tall, skinny girls and preppy 20-something guys were in attendance - pretty standard fair for an alt rock band performance. Some quietly waited, while others stood in groups and talking and bantering. A friend and I went up to check out the vintage equipment, commonly seen in Mutemath's setup, that was crammed onto the small stage. Out of nowhere, the entire band entered via the audience door, and processed up to the stage, marching band style. And just like that, it was on. We knew this because Drummer Darren King approached his drumset, put on his over-the-ear headphones, and performed his signature application of duct tape around the entire headset and his face. It was a surprise that the show was starting for what felt to me like a tentatively small crowd. However, as we would find out, the crowd would not grow any larger that evening. The hallmarks of any Mutemath performance are an amazing combo of sweat, high stage volume, instrument-trashing, and acrobatics, all while maintaining a tight performance and complete control of the stage and crowd. Right from the start, this show was no exception. Despite the small size of the stage, they managed to move comfortably between instruments, and did so almost constantly. The suit and tie clad singer/keyboardist Paul Meany moved between 2 different keyboard setups (Hammond, Rhodes/Mini Mogue) and occasional drum banging at a third station, all the while sweat dripping from his face like a leaky sink. New guitar player Todd Gummerman was also seen occupying each of the keyboards a few times throughout the evening. The bread and butter of Mutemath's sound is the powerhouse rhythm section that is Roy Mitchell-Cardenas and Darren King. Mitchell-Cardenas' bass lines were syncopated, busy, and perfectly locked to King's gritty, in-your-face, hi hat rich drumming style, creating overtones of electronica. But like their keyboard and guitar playing counterparts, their chops were not without a bit of performance flair. Mitchel-Cardenas' "Cousin Ed" hair was flying everywhere as his head bobbed. During their performance of Reset, King dumped his water bottle out onto his toms, causing a spray of water against the backdrop of lights, and a terrific visual display every time he hit one. 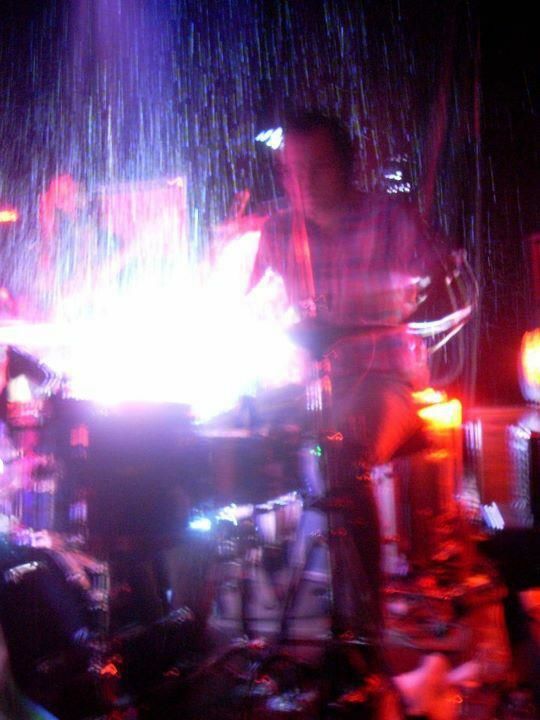 As the water rained down on him (and surrounding equipment), his riveting performance was unphased - marked by his continuous, intense, blank stare, rife with concentration and seeming vendetta toward his unlucky drum kit. At one point Meany asked who had traveled from out of town to see the show. Over half the people raised their hands. Upon ascertaining that at least some part of the contingent was from Canada, he asked how many were from Montreal. I had a moment of shock and dismay as almost the same number of hands went up. I remember the moment I heard that Mutemath was finally coming to play at my hometown music venue. It was a moment I had been waiting a long time for. The 4 piece alt rock band out of New Orleans has been something of legend in my mind. At one time, I had watched countless Youtube videos of their high energy performances, all laiden with theatrics, stage acrobatics, and what appeared to be organized chaos. I first stumbled on Mutemath literally by accident, while searching for something else on a music download service, and decided to give them a listen. The first song I heard was "Reset" off their first album (Reset EP, 2004). After that, I watched the "Typical" music video, shot as they performed the entire thing in reverse, and then played "forward". My friends and I obsessed over amazing videos, such as the ones in which drummer Darren King is seen crowd surfing on top of a bass drum (sometimes more successfully than others). Around that time that I was discovering them, they were finishing up their second full album tour (Armistice, 2009), and we had missed it. Friends and I waited patiently for the opportunity to see them do a follow up tour. And waited, and waited... 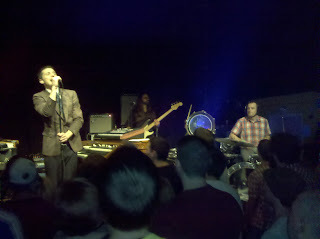 I think this delay may have begun a cascade-effect downturn for Mutemath. By their own admission, their follow up to the self-titled, grammy nominated album took much longer than they had hoped to release. The strange part is, looking at the sheer number of tracks on the album (20!)... why they didn't decide to drop some ballast. My guess is that a 12 or even 10 song release that was on schedule would have kept their music industry momentum, and the situation could be very different for them today. Rather, by the time their 2nd album was released, it went fairly unnoticed by those not in the know. Sadly, their 3rd release and supporting tour may be on the same road. Will Mutemath will recover their upward movement toward stardom, if the word gets out about their exciting performances? Perhaps. In the meantime, I'll be attending as many of their shows as I can, as will any other fan who is lucky enough to get wind of them.